"It is a very sad day for The Episcopal Church"
It is a very sad day for The Episcopal Church. It is also a sad day for me, a faithful son of that church. Nevertheless it is also a hopeful day, hopeful because of the unstoppable Reformation that is overtaking the Christian Church in the West. It is also a hopeful day for me personally as I am unanimously welcomed into the House of Bishops of the Anglican Province of the Southern Cone, an act applauded by Anglican archbishops, bishops, clergy and people all around the world. The Episcopal Diocese of Pittsburgh will move forward under its new Ecclesiastical Authority, its Standing Committee. That body will carry the diocese through to our realignment vote on October 4. With the success of that vote, it will be possible that we be joined together again as bishop and people. I offer my deepest thanks to the company of saints all around the globe who have sustained me, my wife and all who are dear to me in these days. 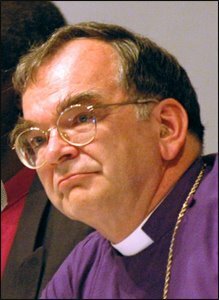 ← No consequences for Episcopal Church’s actions that have fractured the Anglican Communion?